In 1970, in the small West Tennessee town of Stanton, sat a young couple who together committed their lives to serving God as Linda sang a song to Royce that he had never heard before, “JESUS USE ME”. Royce told her, "That is my prayer," and it forever changed their lives. Linda, a faithful prayer warrior, never gave up praying for her lost husband, and Royce accepted Christ as his savior January 10th, 1970. Never stop praying! Never give up hope! Two weeks later Royce started playing lead (a Sears and Roebuck guitar) for his cousins the Finchers, from Frog Jump TN. Linda was singing with her sister, Gussie Hughes, and Sarah Kee in a female trio from Crockett County, TN. Their twin daughters, Darla & Debra started singing an occasional song when the trio sang and also when they would go with The Finchers. When the girls started singing harmony the family felt the call from God to start a family group ministry. So Royce left the Finchers in 1971 and years later The Barnetts are still a going with the original four they started with and several more. In 1985, Darla married Jesse Dedmon. They have two children,a son, Rory-Taylor (10/24/91)and as of December 17, 2016, a Daughter-in-Love, Savannah Hope Jewell Dedmon and a daughter, Katelyn Victoria "Katie" (6/20/95). In 1986, Deb married Tracy Rodgers, formerly of The Rodgers from Atwood, TN (his family’s group). They have a son, Greg (6/25/90) and as of June 29th, 2013 a Daughter-in-Love, Katherine Sullivan Tritt Rodgers.Then June 12, 2018 the 4th generation made his appearance. Greg and Katherine had their first child, a son, Benjamin (Ben) Wayne Rodgers (6/12/18). Royce plays lead guitar, harmonicas, fiddle, and banjo. He also sings. Linda plays the piano and sings and makes sure we don’t go hungry!!!! She also takes care of the scheduling and bookkeeping. Darla plays the bass and piano and sings. Rory-Taylor plays the rhythm guitar and sings. Deb plays the piano and sings. Tracy plays the bass and sings and Greg plays the drums and has played them full time for the group since he was five years old and sings. Katie sings and she also sings with Rory-Taylor, Greg to form the third generation of Barnetts. Hope also has a lovely soprano voice and sings with us. On occasion we are blessed to have Jesse and Katherine join us. Jesse plays the rhythm guitar and sings, Katherine has a beautiful voice and can be found singing with her mom, sister and sister by marriage at their home church. Royce and Linda Barnett are members of Stanton UMC Church in Stanton TN and have been members since 1957. Jesse, Darla and Katie Demon are members of Allen Baptist Church in Brownsville TN, as well as Tracy and Deb Rodgers. 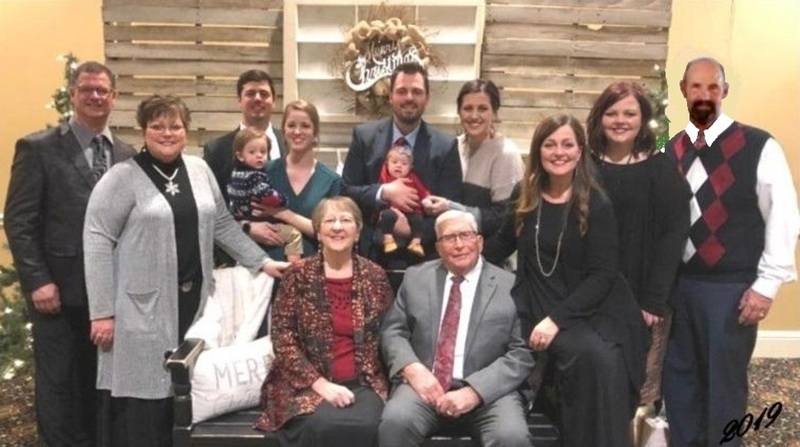 Greg, Katherine and Ben Rodgers belong to Mercer Baptist in Mercer TN and Rory-Taylor and Hope are members at Bellvue Baptist Church in Cordova TN. Royce and Linda received The James Blackwood Lifetime Acheivement Award in 2000. They also celebrated their 50th Wedding Anniversary May 11, 2007. In 2015, Darla & Deb received the same award their parents did 15 years earlier, The James Blackwood Lifetime Acheivement Award. Our prayer is that God’s will, will be done in the ministry He has called our family into. PLEASE, PULL THE CORRECT MAP BY CLICKING ON THE "EVENT NAME" AND NOT LOCATION. YOU CAN GO THE MAP FROM THE EVENT PAGE. DUE TO CIRCUMSTANCES BEYOND OUR CONTROL, SOME MAPS WILL STILL NOT BE TOTALLY ACCURATE.